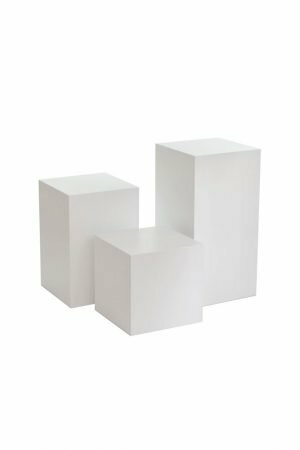 If you would like to use your Exhibition Plinths as storage space, then plinths with shelves and a door could be the answer. 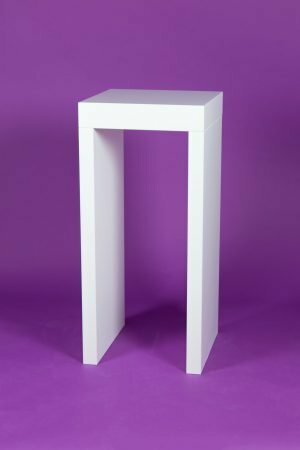 We make sure the plinths are seamless and we want the door to fit into that style. 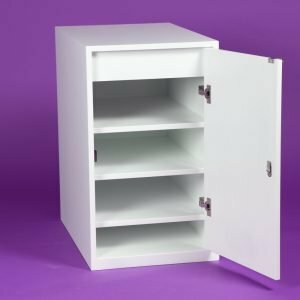 Client feedback has been very positive, that being able to use the cabinets as storage has been a huge help in their shops or at exhibitions. 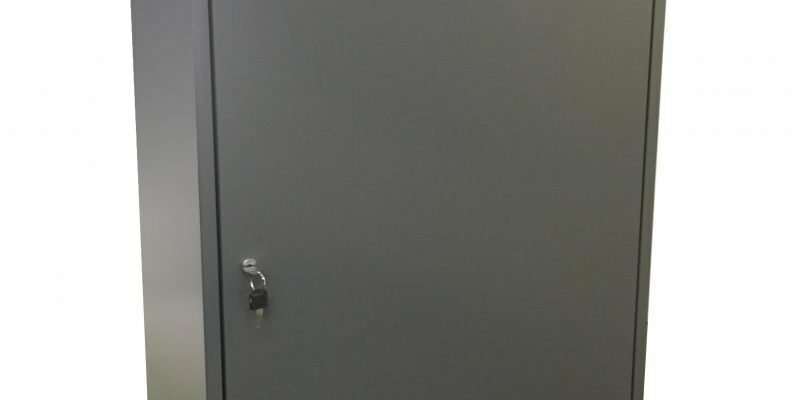 With the door itself, it can be lockable. Alternatively, it can have a push opening catch inside if you don’t want a lock showing on the outside. 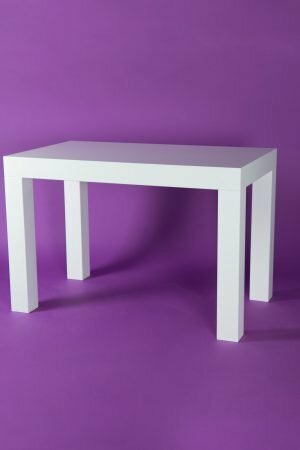 Some clients have doors in some of their plinths and not in others. 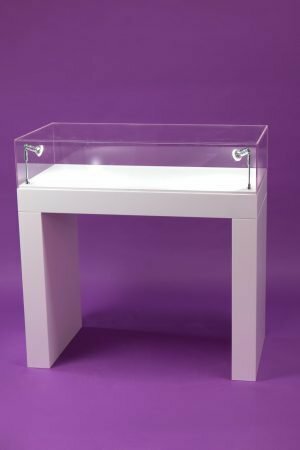 When we have installed exhibitions we have noticed that plinths with shelves are more popular for personal belongings than for stock, in terms of what’s being stored inside. It’s nice to be able to lock away your handbag or briefcase, removing and need to worry about security whilst at a show. Peace of mind is key! 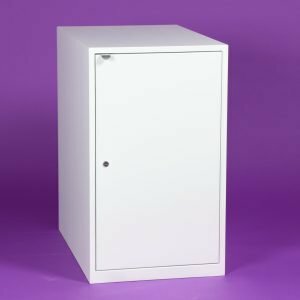 In a retail environment, sometimes the public or delivery drivers have access to staff rooms and communal areas with a rear entrance, so a lockable plinth with shelves in the shop could be equally as useful in a shop for you or your staff. Shelving inside is a matter of personal choice – what you wish to store inside. The shelving is designed so that you can put them at any height you wish. The holes we drill on the inside mean you can choose the position of the shelving. These dark grey plinths shown in the images is our standard way of having doors and shelving in plinths. Sometimes customers request us to have a slightly different manner of storage in plinths away from the standard look. I have put a few images and descriptions for you below, for more design ideas and inspiration. Adding a small handle to the top, as shown in the purple background images below means that you don’t have to use the key in the lock to be able to open the door. The white plinth pictured right, has a cupboard and 2 open shelves at the top. The open shelving could be facing forward to encourage customer interaction, or facing the staff member. With seamless edges, which way the plinth faces doesn’t matter. Again in this case, the door at the bottom can be lockable or a push open catch. 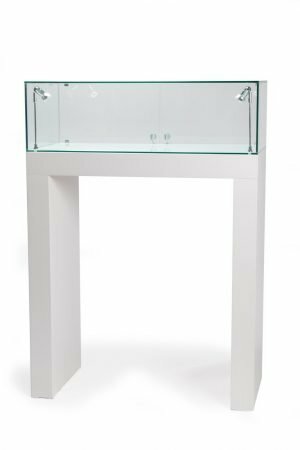 If you would like to order Exhibition Plinths With Doors and Shelves, please contact us on 01934 708 717. Russell or Ellie will be delighted to help you.